Mussels are one of my favorite things to share. It’s rare that I ever eat them alone. A pot of mussels in a savory sauce is meant to be shared. One of my favorite memories of sharing mussels is finding a restaurant in Sydney, Australia that served an all-you-can-eat mussels special on Tuesday nights. They had several different sauces to choose from, like mussels steamed in wine, Thai flavored mussels and mussels marinara. All served with another of my favorite things – a big side of french fries. But the best part of the dinner was getting caught in a huge rain storm on the way home. And while I’ll probably never replicate that night, eating mussels will always bring back that wonderful memory. 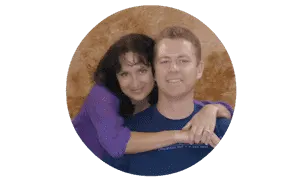 So even if you don’t get caught in the rain on a romantic vacation in an exotic destination, I still recommend making the mussels and sharing them with someone special. Scrub the mussels until they are completely clean. When the butter is melted, add the leeks and cook for 5 minutes. Add the garlic and continue to cook for about 5 minutes until the leeks are soft. Do not burn or over brown. Add the tomato and wine and allow to simmer for about 2 minutes. Add the mussels, cover and simmer for 5 - 7 minutes until the mussels open. Garnish with the lemon zest and parsley and serve with crusty bread to soak up the sauce. 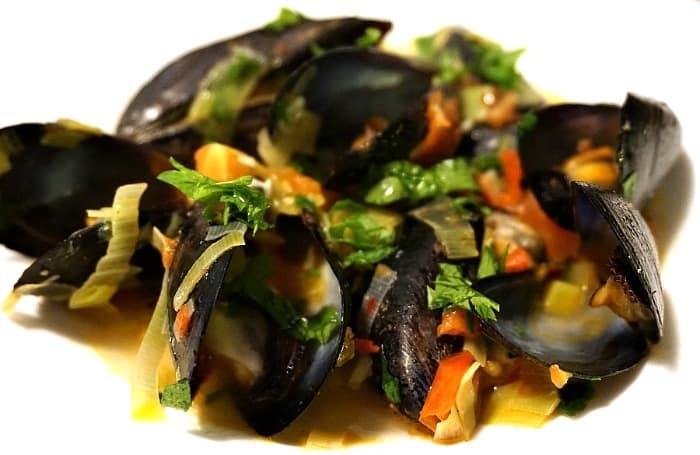 This mussel recipe can also be served over pasta. 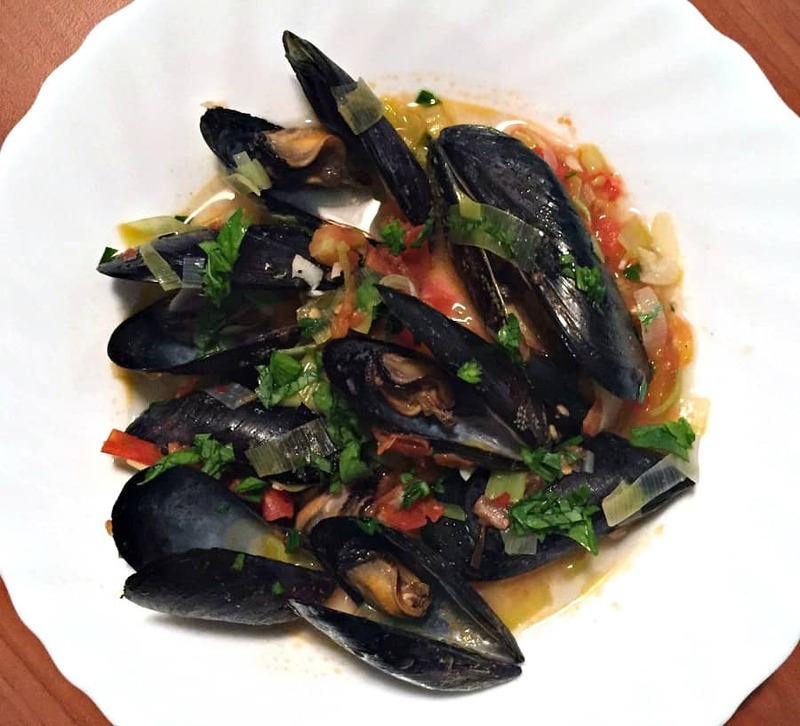 For a slightly thicker sauce, remove a portion of the sauce after the mussels are steamed and cook down to reduce. For a richer creamier sauce, add another tablespoon of butter or/and replace 1/2 cup of white wine with heavy cream. Visit our food finds/recipes section to see our full collection of recipes inspired by our ongoing travels around the world! Utterly classic deliciousness, I don’t cook mussels enough! Mussels are a favorite of mine and I always enjoy them when I visit my folks who live at the beach. I think your recipe has all the ingredients for a hearty meal. Just needs a big hunk of bread to soak up the broth. Yum. 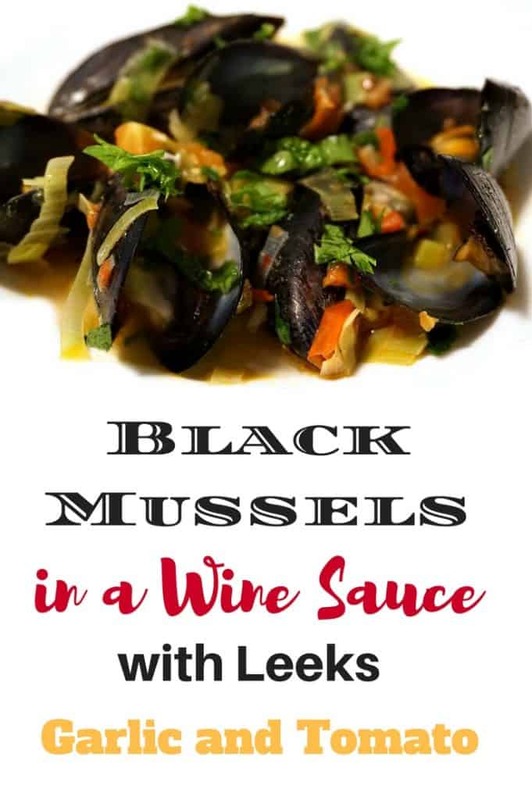 These sound amazing – I looove mussels and haven’t made them in FOREVER@! Not sure I’ve ever seen an all you can eat mussels night at a restaurant because I would be all over that!